Satake have conducted numerous tests to establish the capability of the machine and have extensive field experience of its applications. The grinding action within the Pin Mill is achieved by impacting the product particles with a series of hardened steel pins. The product enters through the eye of the machine and then passes through rows of pins rotating at high speed between stationary pins. The product particles are shattered into fragments as they progress towards the outlet. This action creates a fan effect and a high volume of air is drawn through with the product, keeping it cool. 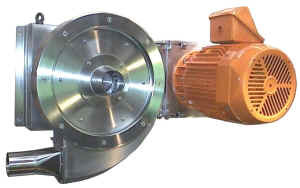 The machine’s grinding action can be controlled by altering the feed rate to the machine and the speed of the rotor. The RPMC Pin Mill is compact, hygienic, requires little maintenance and will self clean when changing from one product to the next. The RPMC Pin Mill can be manufactured to a number of standards, from the basic machine in all mild steel up to dairy standard with all parts in stainless steel allowing it to be washed down. The machine can be gravity fed or installed in pneumatic conveying lined which allows it to be adapted to suit many applications. Air purged seals for the main shaft are offered as an option and are recommended for certain installations.